3 plugs with REALFISH design "perch". You can fish for every predator with these plugs in silent waters as well as currents. 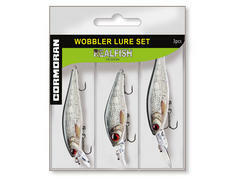 3 plugs with REALFISH design "roach". Universal plugs for all situations and nearly all predators. 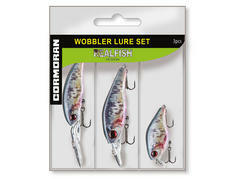 3 plugs with REALFISH design "dying roach". 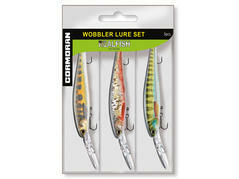 Very catchy for dull predators, which are seeking for easy prey fish. Present the plug slowly. 3 plugs with REALFISH design "baby brown trout". 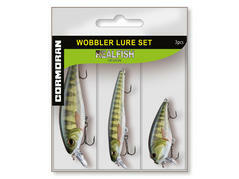 Very catchy for perch, trout and chub as well as pike and zander in the warm season. 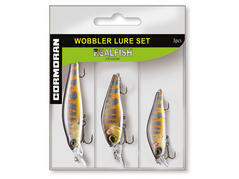 3 plugs with REALFISH design "little carp". 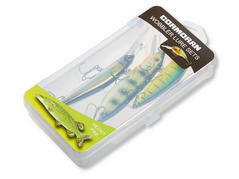 These plugs are suitable for silent waters as well as for currents and catch nearly all kind of predators. 3 diverse plugs with 3 different REALFISH designs: dying roach, brown trout and perch. Universally applicable plugs for all fields of application and nearly all kind of predators, especially trout and perch. 3 identical floating all-round plugs with a diving depth of approx. 1.2m with 3 different REALFISH designs: dying roach, brown trout and perch. Universally applicable plugs for all fields of application and nearly all kind of predators. 3 identical floating deep runners with a diving depth of approx. 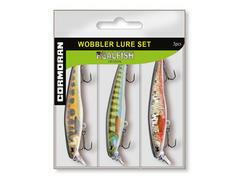 3.0m with 3 different REALFISH designs: dying roach, brown trout and perch. Universally applicable plugs, especially for silent waters and all big predators like zander and especially pike. 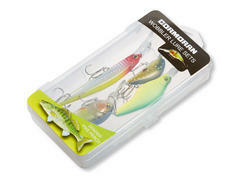 This plug assortment has been composed for pike as target fish. Equipped with premium trebles. 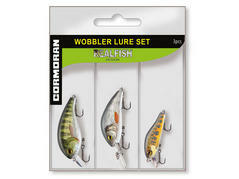 The plug assortment is delivered in a small tackle box for transportation. This plug assortment has been composed for zander as target fish. Equipped with premium trebles. The plug assortment is delivered in a small tackle box for transportation.